Clinique Sommeil et Santé offers a multitude of tests to diagnose sleep-related problems. Our sleep lab is equipped to monitor and diagnose sleep apnea, insomnia, restless leg syndrome, periodic leg movements, narcolepsy, snoring, hypersomnia, sleep related eating disorders, drug and alcohol related sleep disorders, circadian rhythm disorders, parasomnias and more! Book an appointment with us and we will advise you on the necessary tests required to diagnose and treat whatever sleep condition you may have. A medical doctor’s prescription is mandatory for any of these tests. A detailed questionnaire with instructions will be sent to the patient once an appointment is scheduled. 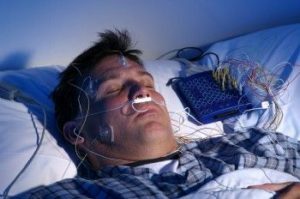 A complete polysomnography is a complex procedure which serves as an essential tool for the diagnosis of sleep disorders. It may be performed by trained Registered Polysomnography technologists (RPSGT), Registered Respiratory therapists (RRT), EEG technicians or nurses. This test encompasses the collection and analysis of a person’s sleep physiological signals i.e. Electroencephalography (EEG), Electro-Oculography (EOG), Electromyography (EMG), Electrocardiography (ECG), Oxygen saturation, limb movements, snoring and body position. Electrodes are attached to the scalp (to measure brain activity), on the outer edge of the eyelids (to capture eye movements) under the chin (for muscle activity), shoulders (for ECG) and legs (for leg movements) The readings from these electrodes are used to identify different sleep disorders. A finger probe is used to measure blood Oxygen levels and a sensor is placed in front of the nose and the mouth to measure breathing. Two belts are placed on the chest and the abdomen. Live video recording is used as well. The data is analyzed by an RPSGT or an RRT and then interpreted by a pneumologist or a sleep specialist. A report including examples from the sleep study and the MD’s interpretation are sent to the referring physician. A full night Polysomnography including CPAP titration if diagnosis of OSA (Obstructive Sleep Apnea) is confirmed in the first half of the night. An auto CPAP titration is performed to establish the optimal CPAP pressure level. This test is done at client’s home for 3-7 nights. Lab titration is done in the lab with complete Polysomnography (16 channels). Multiple Sleep Latency Test is done to diagnose narcolepsy. This test can also help in evaluating daytime sleepiness or effects of medications on sleepiness. Maintenance of Wakefulness Test is performed to objectively evaluate daytime sleepiness. Oximetry is usually performed on young children to rule out sleep apnea. It helps physicians prioritize the surgery. This is a simplified Polysomnography which measures only cardio respiratory channels. It is done at client’s residence. on any of our diagnostic tests!